Does evidence support the claim that e-cigarettes are a gateway to cigarettes? No. Since the campaign cites the biennial Kentucky Youth Risk Behavior Survey, I have used KYRBS data to illustrate smoking and vaping among high school students in the Commonwealth from 2005 to 2017. The chart at left shows that current (past-30-day) smoking declined from 26% in 2005, to 24% in 2011. E-cigarettes were not widely available during that period. In contrast, during the e-cigarette era (2011 to 2017), current smoking dropped from 24% to 14%. The prevalence of current vaping, collected only in the latter two years, was 23% and 14% respectively. With the data showing show an unprecedented decline in smoking rates, there is no e-cigarette crisis among Kentucky high schoolers. 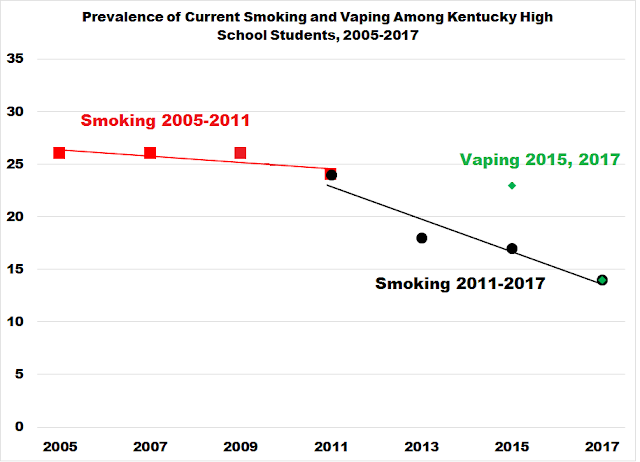 Kentucky health organizations should stop obsessing about a mythical high school vaping crisis and focus instead on stopping other behaviors and activities that State data define as immediate health and safety threats. The newly released 2018 Monitoring the Future survey results provide further evidence of a sharp decline in cigarette smoking among high school seniors, coinciding with increased vaping. The rate of current smoking (in the past 30 days) plummeted to 7.6% from 9.7% the year before. Even more impressive, the rate represents a 60% drop from 2011 (18.7%), which is the year that teens started to vape (evidence here). Current vaping (any or no drug) increased in 2018 to 27%, reflecting use of nicotine (21%), marijuana (7.5%) and/or flavors alone (13.5%). Surgeon General Jerome Adams called the increase an “epidemic” and issued a plea for “all hands on deck.” (here). Oddly, federal officials continue to focus more on vaping than on use of intoxicating drugs. High school seniors still used alcohol at a far higher rate than cigarettes (30% versus 7.6%), and over twice as many (18%) reported being drunk in the past month. Marijuana use was 22%; it’s been in this range since 1995. To his credit, most of Dr. Adams’ media comments were evidence-based. That wasn’t the case with the director of the National Institute of Drug Abuse, Dr. Nora Volkow, who said that vaping “might be paving the way for a transition to conventional cigarettes as well as other substances.” (here). I have previously demonstrated that these gateway theories are false and based on fatally flawed research (examples here and here). The Surgeon General wrongly claimed that nicotine is “very and uniquely harmful” to the developing brain, and his web site asserts that vaping can impair learning and memory in those up to age 25 (here). That claim implies that a significant percentage of the 40 million current smokers and even more former smokers, most of whom started as teens and smoked for decades, have brain damage. There is no scientific evidence to support this allegation. In contrast, there is unequivocal evidence linking youth football and other concussion-producing sports activities to chronic traumatic encephalopathy (CTE) (here, for example). If the Surgeon General and others want to protect children’s brains, this would be a more productive area for their focus. Dr. Adams’s statements were embellished by the usual tobacco prohibitionists, including Dr. Josh Sharfstein of Johns Hopkins University, who said, “There’s no more credible or influential voice on nicotine and tobacco than that of the U.S. Surgeon General.” In fact, the current advisory is only the latest in a series of hyperbolic tobacco pronouncements by surgeons general over the past decades, including Dr. Vivek Murthy (here), Dr. Regina Benjamin (here), Dr. Boris Lushniak, Dr. Richard Carmona and Dr. Antonia Novello (here). In 1992 Dr. Novello predicted “an oral cancer epidemic beginning two or three decades from now if the current trends in spit tobacco use continue” (here). That epidemic was not just a fabrication, it was based on a completely false premise. Smokers who are interested in vastly safer alternatives to cigarettes need to know that companies have filed four FDA applications seeking approval for advertising or marketing claims that their products are safer than cigarettes. 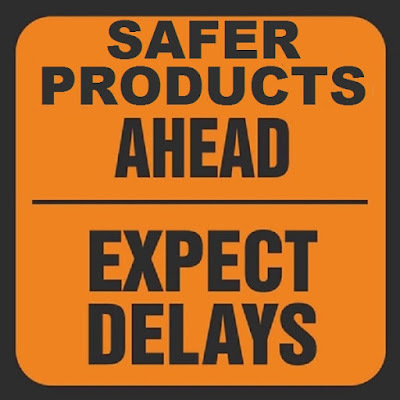 Technically, the companies are seeking “modified risk tobacco product”, or MRTP, approval. Here are status updates on the applications. Swedish Match submitted the first MRTP application for General Snus four and a half years ago, asking to change grossly inaccurate but federally mandated warning labels on its smokeless products (here). The FDA rejected the application in December 2016, using flawed regulatory interpretations (here). In September 2018, Swedish Match requested approval of this language: “Using General Snus instead of cigarettes puts you at a lower risk of mouth cancer, heart disease, lung cancer, stroke, emphysema, and chronic bronchitis.” The term “lower risk” is an understatement, as the risk is almost zero. The FDA scientific advisory committee will consider this application on February 6, 2019. Philip Morris International (PMI) filed an MRTP application for its IQOS heat-not-burn tobacco more than two years ago. The FDA scientific advisory committee met in January and agreed that “Switching completely from cigarettes to the IQOS system significantly reduces your body’s exposure to harmful and potentially harmful chemicals.” (here) However, the FDA hasn’t reached a decision about allowing this factually correct statement to appear. Even worse, the FDA has yet to act on a separate PMI application to put IQOS on the market in the U.S., even though its availability in Japan and other markets are decimating cigarette sales (here). Based on predictions from industry analysts, it appears that the agency is slow-walking the application (here). R.J. Reynolds filed an MRTP application in March 2017 for its Camel Snus products (here). They requested approval for three statements, this being the most comprehensive: “Smokers who switch completely from cigarettes to Camel Snus can significantly reduce their risk of lung cancer, oral cancer, respiratory disease, and heart disease.” The FDA’s scientific advisory committee reviewed the application in September; formal release of their recommendation is pending. The U.S. Smokeless Tobacco Company in March this year submitted an MRTP application for Copenhagen fine cut snuff. The company sought approval for a simple statement: “Switching completely to this product from cigarettes reduces risk of lung cancer.” The FDA scientific advisory committee will consider this matter on February 6, 2019. The wheels of regulation grind slowly. The months and years go by, and smokers continue to die.